Lori Lennon is spending her summer on foot under the blazing hot sun, chatting up residents in her Massachusetts town and listening to their concerns and suggestions. Lennon, a 36-year-old communications executive and proud Solo Mom, is making her first run for public office, looking to unseat the longtime incumbent, Sean Garballey, in the 23rd Middlesex District of the Massachusetts House of Representatives, which includes the towns of Arlington and West Medford. Lennon recently left her position as the director of communications for Northeastern University’s College of Science so that she could devote herself full time to her nine-year-old daughter, Keira, and the campaign. Her platform includes solutions for affordable child care and a joint affordable-housing and public-transportation plan to stop residents in this Boston suburb from being forced from their homes due to rising housing costs. Lennon and Garballey will face off in the Democratic primary on September 4. In addition to winning her primary, and then the general election in November, Lennon is hopeful that more women will come forward to run for office. 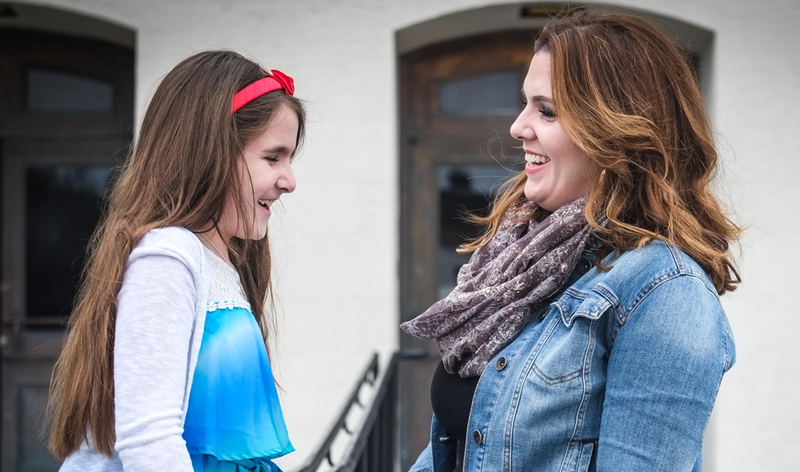 Lennon spoke with ESME about her first campaign for public office, how campaigning has been empowering for her and her daughter, and how other Solo Moms can get involved in their communities. Q: What does a typical day look like in your house this summer? A: Yesterday we got up, I was doing some work, and it was 1,000 degrees in the house, so [Keira] was just lying in front of the fan. We went out and did some campaign stuff together, and at night we went to go see a show in Boston. It was really cool. And I think that’s really empowering. Even to the point where we go to a restaurant, and she orders for herself. We do a lot of things together because it is just the two of us. This is another story we can share, which is really exciting. I do think we are like two peas in a pod. We have a nice little partnership, and I really do treasure it. Q: Why run for office? A: I’ve always wanted to, always been interested in it. I wanted to make sure that I had the experience I needed and the timing would be right for me. Last year, I took a course called Emerge America. It’s here in Massachusetts, and there’s a few across the country. It trains Democratic women to run for political office. I’d been involved with the organization for a while. I had done social media training for them and was on the board for a little bit. I always loved what the organization offered. I decided that I wanted to run, so I took an excellent training program; it was incredible. It comprised a really strong network of women and had a good support system. My campaign manager is also from Emerge America. It just kind of gave me the last bit of information and the tools that I needed to make sure I was completely prepared. And that’s what I like to be: completely prepared. It was a wonderful experience and definitely gave me the launching pad I needed. Q: Why is it important for women to stand up as leaders? A: Because there’s not enough of them. I do think that women have a lot to offer, and they have a very different perspective. We are collaborative by nature, and I think that’s a tool that we could be using more of. I know here in Massachusetts, we would need to elect 51 women to gain equity, to be a 50-50 partnership in the state house. And that’s a lot. I will say that I’m not running because we need more women elected. I have a lot to offer as a candidate. Being a woman is important, too. But the ideas and initiatives I’d like push forward are definitely something this district could use. Q: What is your campaign platform? Where did those ideas come from? A: My campaign platform came not only from experience but also from what I see as opportunity through talking to people. And just seeing opportunity and struggles that people are experiencing and trying to figure out ways to address them. I know affordable child care is a big issue and that affects everybody. It’s not just something that impacts a pocket of people. I know for me, I think we paid $90,000 for child care before Keira was in kindergarten—and that’s a lot of money. There are a lot of families out there who are going to be facing the same scenario: “Should one of us stay home? Who is that person going to be?” [Massachusetts is] definitely one of the most expensive states when it comes to child care. Just kind of shrugging your shoulders and saying, “That’s the way it is” is not a solution I’m happy with. That also rolls in the MBTA [Massachusetts Bay Transportation Authority] and finding affordable housing. It’s a big nut to crack. What the state needs to do is start looking at affordable housing and transportation together. We’re seeing housing prices skyrocket the closer you get to the city, which is a natural occurrence. We’re also seeing that public transportation isn’t necessarily available for people who need to move further out because of the housing crisis. But we also need to make sure we can find solutions for people who want to stay in their districts or their towns. We don’t want to start displacing people or kicking the elderly out of their homes. I would love to find solutions to help make it more feasible for people, whatever phase of life they are in. Q: What are some of your solutions? A: For the housing and transportation, one of the good solutions that I would really like to look at is making transportation more accessible so that people could move further out. That’s a really immediate solution: expanding commuter rail lines, making the schedules more consistent. We have a commuter rail station in West Medford. I was knocking on the door of someone who could see the station from her backyard. And she said, “I can’t use that, so I drive into town” because the train doesn’t run on a schedule that’s conducive to her, and that’s what a lot of people do. It’s less than 10 miles [to Boston], and it takes over an hour to [get into the city via] public transportation, which is crazy. A lot of people, including myself, drive, which is making the streets so congested. It’s not just congesting main roads; now it’s all up and down the side roads as well. Q: What do you hope to teach your daughter through your campaign and your time in office if you win? A: This is something that I’m very passionate about, and I feel I could be a very strong leader for this district—that’s the main reason why I’m running. Where I think that comes into play for my daughter is that she’s seeing I’m taking initiative—that 1) I’m passionate, and 2) I’m driven to succeed. To be a really impactful player in this position and knowing that I’m going for it is something I think is important for Keira to see. She should know that if you’re passionate about something, if you see that can make an impact somewhere, you do it. We were talking the other day in the park and she was like “When I’m 16, I’m going to get my license, and when I’m 18, I’m going to run for office.” And that’s something I’ve never heard her say before. I know it’s symptomatic of the environment she’s in right now, but I think that this is empowering her to do what’s she’s passionate about, whatever it is. She’s also seeing it’s a lot of hard work. It’s a good lesson for her to see, too, that with passion and drive come the work behind it. It’s not something where you can snap your fingers and make it work. She’s seeing all the work time that’s put into this—all the meetings, all the canvassing, all the talks. Q: As working Solo Mom, what are your tips for other moms? A: Just network. Having a network and having your people are really great. That has been instrumental in this journey, and also it’s just nice to have people around you. Having people who can support you in whatever way you need is wonderful. Q: Who is in your network? A: Everybody! It really does run the gamut. I’m friends with a bunch of single moms, really wonderful families. I coach soccer, and there’s this woman who coaches with me who’s wonderful. [Keira] goes and sees her dad. There are former colleagues, current colleagues, people in my neighborhood, family. It is pretty vast, which is wonderful. Q: How can other Solo Moms get involved in politics or running for office? A: Start building a coalition. It’s not something that has to happen overnight. Start building a network of people. See if there are any programs out there that provide training opportunities. But definitely start building a network and getting out there and finding out how they want to be involved. In our district, there are a lot of organizations and groups that focus on a multitude of things. That’s a really great way to start. Just find your people. And know you can do it. You’ll figure out a way to do it if you’re passionate about it. Mary Catherine Roberson is another Solo Mom who ran for office. Do you know any others?